If the title above comes off as a little too screwy, forgive the writer’s awful proclivity for horrid puns. 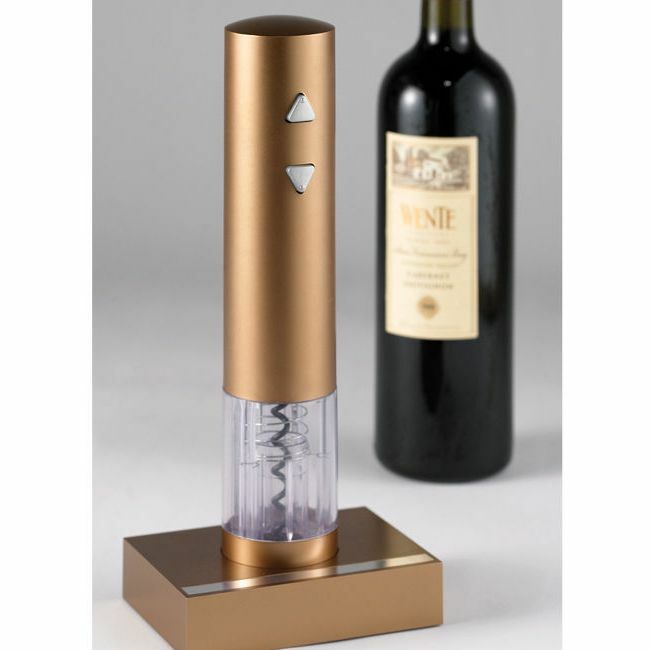 Seen below is the blandly titled ‘Electric Wine Opener’ that’s being billed as a best of breed model. According to the source material, it can unscrew corks at a rapid pace without any pressure or effort from the user. In fact, the same glowing copy cited an ‘expert’ who praised how the Electric Wine Opener, with just the slightest press of a few buttons, undid 49 bottles without anyone breaking a sweat. If that isn’t a solid soft-sell enough, try visiting the source link down south. In it, the $39.95 gadget comes with its own stand, a foil cutter, and a coppery golden sheen. Sicne the holidays are upon the world, stuff like this usually adds a dose of cheery high tech whenever the relatives want to indulge in a toast or three. But if you really want to impress the guests, forsake the wine, grab a champagne bottle and slice the neck open with a sword—Cossack style! Might take some practice or elese you could get someone killed.